Having always had a passion for baking, and after attending her first cake decorating course more than 20 years ago, Rebecca got hooked on the design and decoration of cakes for family and friends. Rebecca set up her own cake decorating business in 2011 producing beautiful classic and contemporary bespoke wedding and celebration cakes from her home in South Wales. Since then the business has grown and this year it became apparent that there was a need for separate business premises as the business had outgrown the domestic environment. Now operating from her cake studio in Cilybebyll, Rebecca continues to produce her beautiful cake creations. Rebecca specialises in handcrafting sugarflowers, for which she has won numerous awards. Her sugarflower sprays are made specifically for each cake and can be perfectly coloured to match the wedding colour scheme. Rebecca’s cakes not only look stunning, they also taste gorgeous, so from a traditional rich fruit cake to an indulgent chocolate cake, Rebecca uses her tried and trusted recipes and ensures that all of the ingredients are of the highest standard and locally sourced. Rebecca Gilmore regularly contributes photographs of her cakes for this International magazine. Rebecca Gilmore Wedding Cakes features in the Margam Park Orangery promotional wedding brochure. Rebecca Gilmore Wedding Cakes features in the Wedding Planning Secret website. The Wedding Planning Secret is the home of reliable wedding planning tips, advice and ideas. It is one of a series of five online magazines that offer prospective brides and grooms a wealth of useful in-depth information about all aspects of wedding planning. Rebecca Gilmore Wedding Cakes features in The National Wedding Guide which offers you all the top recommended national services that are local to yourself, from local bridal boutiques to online wedding shops. It can sometimes be very hard knowing exactly where to start. Simply search their online wedding directory and make your wedding planning stress free. 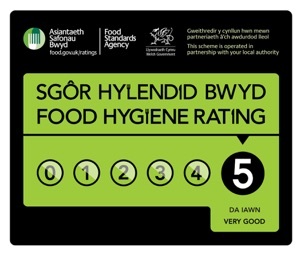 Rebecca Gilmore Wedding Cakes has been awarded a 5 star rating in the National Food Hygiene Rating Scheme in conjunction with the Food Standards Agency and has also received an award in Food Safety in Catering certificate by the Royal Society for Public Health. Rebecca Gilmore Wedding Cakes has full public liability insurance. 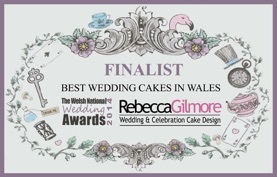 In both 2015 and 2014 Rebecca was nominated for the Welsh National Wedding Awards by her customers and was delighted each time to reach the final in the Best Wedding Cakes category at the prestigious award ceremony. The Welsh National Wedding Awards recognises the best that the wedding industry in Wales has to offer, most importantly voting for the awards is done by the customers of these companies. Rebecca is very grateful to her past customers for their support and votes.